These stakes are on us. 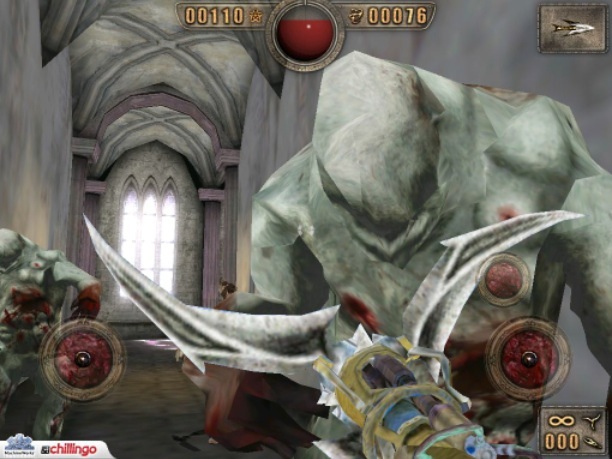 Painkiller rocked PC gamers with fast-paced run and gun combat, gorgeous graphics and humongous bosses. Of course, that was in 2004, when technical mumbo jumbo like volumetric fog and glass simulation were cutting-edge. Today, Chillingo managed to shoehorn the game (now called Painkiller Purgatory) onto the iPhone and the iPad, and while the publisher has a long way to go, this big, bad first person shooter offers plenty of thrills. This is essentially a port of the PC version, complete with 24 levels full of monsters. It still follows the same story, as you step into the shoes of everyman Daniel Garner, who died (along with his wife Catherine) in a car accident. Although she went to Heaven, he was sent to Purgatory for the sole purpose of preventing a war between the angels and Hell's army. To get the job done, he must defeat four of Lucifer's generals, all of which take up a hefty amount of screen real estate. Although they look intimidating, Daniel has plenty of weapons to slaughter both them and the plethora of enemies that attack en masse. His default weapon, the Painkiller, is a three-bladed device that mutilates creatures, sending their guts all over the place. But there's also a shotgun, a rocket-launching chaingun, the electro-driver that fires ninja stars and of course, the most popular device of all, the stake gun. This deadly toy lets you unleash wooden stakes that nail bad guys to walls, giving you a chance to do some redecorating while preventing the apocalypse. Like most iPhone first person shooters, you control Daniel using two virtual analog sticks, and it was clear from playing the game that Chillingo needs to tweak these bad boys. Moving forward and backward with the left stick was easy, but the right stick wasn't nearly as responsive, forcing us to haphazardly slide our thumbs back and forth to make it work. Of course, we don't expect to see Painkiller Purgatory for at least another month, which gives the developers plenty of time to get the game running smoothly. We just hope the iPhone and iPad can display multiple enemies on screen at once, as well as the aforementioned generals, all of whom, by the way, will have rockets with their names on them.